by the Proud to be Step blog! Thanks so much! Not sure exactly what this means, but am appreciative to be considered! 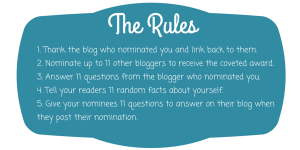 I am to to follow the Rules and nominate up to 11 bloggers I enjoy to follow! Here we go! Why did you start a Blog and what is your blog about? I journal a lot so one day I felt like maybe I needed to start sharing some things I am learning as I go. If you could have any super power, what would yours be? To be invisible! If you could eat any food for the rest of your life, what would it be? Ha, my kids just asked me this the other day…..Tacos or Pizza. I can’t pick just one! A favorite hobby? I like to crochet! What if your dream career? I would like to be a physical therapist for children. Favorite childhood memory? The arrival of my sister. I was three. If you could see the future, would you want to? why or why not? No, maybe out of fear I would some how live with regrets, or mess something up. Where is your favorite place to go? I love going to the beach! Do you have any fur babies? How many? what are they? I have a lab mix dog, a chihuahua, and a hairless cat, sphynx. What is one of your life goals? To see my children become successful adults. I have never gone as long as I have this summer with out applying make up. I have a love hate relationship with cardio. Some days I love it, some days I despise it. My favorite time of the day to clean the house is when the kids are all tucked away in bed. I tried raspberries for the first time in my life today, the actual fruit! I am 30 years old! I am 99.9 percent of the time have a hair rubber-band around my wrist for a fast pony tail. I have been married for 10 years to my Husband, Trey. I recently started using DoTerra Essential Oils and love them! I just started Gilmore Girls on Netflix. I am on Season 2. I hit the snooze button at least twice in the mornings. All of the vehicles we own are black. Here are your 11 questions! How often do you check your blog stats? When was the last time your were inspired? and who inspired you? Now it is your turn, so hurry and get to work! 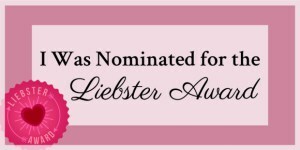 Thanks again Proud to be Step for the nomination!